A story of white collar crime and intrigue told from the point of view of Montague, a member of the privileged class of New York. Montague witnesses the manipulation and upset of the stock market by high financier Dan Waterman who is motivated by revenge. Waterman's character is loosely based on J.P. Morgan. . . .button; even the drawers of its bureaus were upon ball-bearings. The owner's private bedroom measured the entire width of the vessel, twenty-eight feet, and opened upon a Roman bath of white marble. Such was the Brünnhilde, Montague looked about him for one of the yacht's launches, but he could not find any, so he hailed a boatman and had himself rowed out. A man in uniform met him at the steps. "Is Mrs. Taylor on board?" he asked. "She is," the other answered. "Is this Mr. Montague? She left word for you." Montague had begun to ascend; but a half a second later he stopped short in consternation. And he recognised the voice. It was Lucy's! I read this book immediately after finishing The Jungle. They made for an interesting pair of reads, though it wasn't intentional at the time. 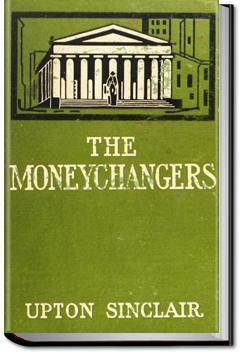 Where The Jungle offers deep insight into the lives of the working poor, The Moneychangers is the story of the mega rich. This book is so prophetic! What a powerful book based on the Panic of 1907. It is a well written quick read, and something I would have expected from Sinclair.